Most parents want to provide their kids with educational experiences as often as possible. And, of course, children love it when their education comes with heavy doses of adventure and entertainment. Therefore, many moms and dads would love bringing their little ones to a nature park or a museum where they can have close encounters with a dinosaur. This amusing YouTube video offers a great example of an educational parent-child outing. LB, the father, and Aaron, the son, visit an outdoor exhibition at the Heard Natural Science Museum and Wildlife Sanctuary in McKinney, Texas. It’s a park that’s filled with lifelike, life-size dinosaurs. As LB and Aaron scamper around and take in the immense dinos, they play a little game. It involves seeing who can identify more herbivores and carnivores. Thus, for young Aaron, the trip isn’t just a lark. Rather, it strengthens his knowledge of biology, paleontology, and the natural world. The video concludes with an unboxing session at home. Father and son open toy dinosaurs, enhancing the day’s joy and educational value. For sure, it was an occasion that neither LB or Aaron will soon forget. If you own a museum, a nature park, or any other type of educational organization, you might consider placing one or more mechanical dinosaurs on your property. You’d surely attract parents and children who are seeking an experience that’s both informative and delightful. Your dinos would bring the kids’ textbooks and school lessons to vivid life. At this point, you might be wondering how you could rustle up a few dinosaurs. After all, they haven’t been that easy to find in the past 65 million years. Fortunately, My Dinosaurs has solved this problem for you. The company produces amazing animatronic dinosaurs, including a full-size Tyrannosaurus rex. It’s about 33 feet long, and it breathes and roars just like the genuine article. It includes a swinging tail, blinking eyes, turning head and neck, moving claws, and an abdomen that inhales and exhales realistically. It’s vividly colored, and it’s definitely a carnivore. Consider how this and other mechanical dinosaurs could fire kids’ imaginations and stimulate their desire to learn more about the subject. It would be a parent’s dream come true. And, once your dinosaur is set up, maybe LB and Aaron will stop by. 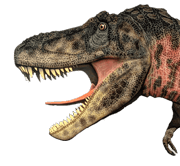 This entry was posted in Learning and tagged dinosaur education, dinosaurs attractions, educational and recreational dinosaur, life size animatronic dinosaur.